Why Do U.S. Water Systems Add Fluoride to Public Water Supplies? The first research into the effects of fluoridated water began in the early 19th century, as researchers established that fluoride occurs in varying concentrations in bones, teeth, and drinking water. By the 1930s, it became evident that moderate levels of fluoride prevent dental caries, and in 1945, U.S. water systems were actively adding fluoride into public water supplies. While there is no federal mandate to fluoridate water, by 2014 nearly 75% of the U.S. population on public water systems had access to fluoridated water. It is widely considered to be a major factor in the 25% decrease in rates of tooth decay in the United States. How does fluoride improve dental health? The addition of fluoride to drinking water prevents dental caries because it maintains a consistent, low level of fluoride in the mouth–specifically in dental plaque and saliva. This reduces the rate at which tooth enamel demineralizes, as well as increases the speed at which teeth are able to remineralize in the early stages of cavities. While data clearly indicates the benefits of water fluoridation, it has also indicated that there may be adverse effects, particularly at elevated levels. One risk associated with fluoridated water is dental fluorosis–the change in the appearance of tooth enamel due to excessive fluoride intake. It is most likely to occur when young children (under the age of 8) regularly consume large amounts fluoride while their permanent teeth are still developing. The hypomineralization of enamel from excessive fluoride intake results in intrinsic tooth discoloration, and it is a very common result of water fluoridation. Along with dental fluorosis, skeletal fluorosis is a debilitating effect of too much fluoride in water. Groundwater with naturally occurring fluoride affects nearly 200 million people worldwide with skeletal fluorosis, particularly in regions like Bangladesh and India. It is an incredibly important issue and we will address it in a later article on our Tips for Taps blog. 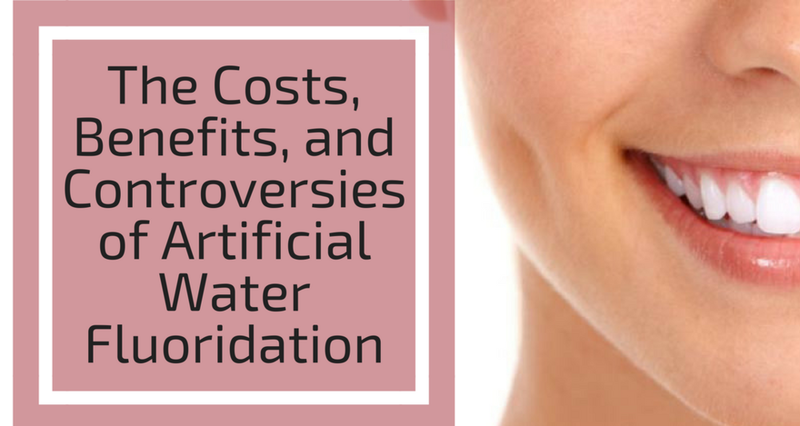 Often considered as one of the most feasible and cost-effective methods of delivering fluoride to all members of the US (regardless of age, education, or income), artificial fluoridation has not occurred without controversy. The U.S. Public Health Service has published fluoridation statistics periodically since 1956, and the reports have given rise to ethical, economic, and health concerns. Some argue that water fluoridation pits individual rights (i.e. an individual’s ability to choose whether their water has fluoride or not) against the common good (i.e. the decision to fluoridate water for the common benefit). Proponents of an individual rights perspective on fluoridated water are dissatisfied that individuals have no choice about the additives to water they drink. Others argue that the common good should take precedence over individual rights, equating artificial fluoridation with vaccination or food fortification. Some have suggested that artificial water fluoridation is the possibly linked to increased risk of cancer. However, recent population-based studies using cancer registry data found no evidence linking artificial fluoridation and cancer risk. Fluoride has also recently been categorized as a neurotoxin. Neurotoxicity occurs when we are exposed to a substance (natural or artificial) to a degree that alters the function of the nervous system, causing tissue damage and impairing the processing and transmission of information. Acute fluoride poisoning is possible, resulting in neurotoxicity, but this is nowhere near the 0.7 ppm concentration added to drinking water. Are You Worried about Fluoride in Your Drinking Water? The literature regarding artificial fluoridation remains overwhelming positive–as fluoride is safe in low, controlled concentrations. It is very rare for naturally occurring fluoride levels in the US to lead to skeletal fluorosis. However, it is important to be aware of what’s in your water–because as the famous saying goes, the poison is in the dose. If you are concerned about your water quality for any reason, Tap Score home water testing offers tailored options for every situation. Tap Score tests for fluoride, as well as 100 other contaminants, and provides comprehensive results in fewer than two weeks. The Flouride Debate | Question 21 | Is fluoride a toxic substance?